So here I am in week 9 of 9x9x25 backtracking to week 7 for many reasons, not least that 3 weeks can flip by in my life like 5 minutes. It happens all the time, but I’m not going to let it hold me back from finishing projects like this 9x9x25 one. Also, I promised an IDIG post for the amazing Ontario Instructional Design Interest Group, and I want to deliver something useful (if a little tardy). What a day! What a week! Just to relax and wind down after the Summit we booked in 2 more days of conferencing at the Technology Enabled Seminar and Showcase (TESS) 2018, eCampusOntario’s annual gathering of Ontario online and technology enabled educators. #OEOSummit18 – if you want to explore the Twitter version of some of the things that happened there. Billy Meinke’s open resources: Keynote transcript Open as a Set of Values, his University of Hawai’i OER Training Pressbook, and his OER for Faculty Workflow diagram as tools to help support colleagues on your campus that are new to the possibilities of open resources for their practice. That these topics are open education is great, but there’s just some good general education advice and ideas around copyright and such that are super helpful. Jessica O’Reilly and Ali Versluis provided some guidance and leadership on Growing Open Initiatives on your campus, complete with their speaking notes in the notes section, a very handy item to include with Google Slides. The OEFellows, listed earlier, rounded out the OEO Summit day leading some questions and explorations with participants around their experiences of open in their practice and on their campuses. I’ll be creating a talk-back document very shortly to provide additional opportunities for conversations around these topics. We ran out of energy at the end of the day (collectively) and couldn’t squeeze in a larger opportunity for wider group discussion. We’ll get there! The full Fellows panel of six presented at TESS about what they heard from OEOSummit participants. #TESS18 and #TESS2018 if you want to explore some of what happened there. In terms of TESS, I know our eCampusOntario team is preparing the recordings from the keynotes by Simon Bates and Robin DeRosa. 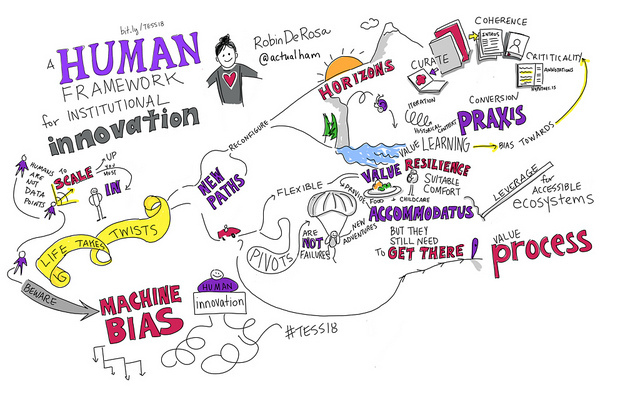 Here’s a link to Robin’s talk, A Human Framework for Institutional Innovation, um, yes. 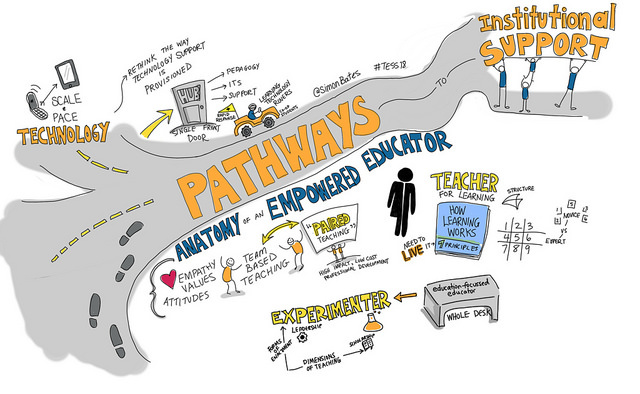 Simon talked about his Anatomy of a 21st Century Educator model in his Keynote Pathways to Institutional Support that is the solid basis for eCampusOntario’s Extend series of modules toward educators becoming Empowered Educators. Those are some nuggets from one week of my world, hope they’re useful. Last, but certainly not least, props to Giulia Forsythe for being an extraordinary Ontario open educator and colleague plus a fantastic artist! When I get together with ID’s over beverages, the conversation inevitably turns towards sharing “war stories” about working with SME’s and senior academic administration. Invariably, the core issue is that no one really knows what our job fully entails and almost everyone thinks our job can be done in 10 minutes – a frustration probably familiar to many abstract artists, wedding photographers, and game coders. As a result, ID’s often find ourselves in meetings with people wanting to migrate courses or entire programs online who think that having some draft lecture Powerpoints on hand is 90% of the work. Unless you can step in immediately and reset their timetable expectations, you’ll be in for a very rough ride with lots of angry and disappointed passengers. This is something most of us had to learn the hard way. I think managing expectations is the real secret to success in this job. Sure, keeping up with research in cognitive psychology, education technology, pedagogy and software licensing is important, but having cutting edge technical skills won’t save you when a project is doomed from the start. Start with a good rapport: It may seem obvious but building a good working relationship with your SME’s and project directors is critical. Each of us does this differently, but make sure you do it. If you can manage it, meeting over an informal coffee is a great way to kick things off after the formal first project meeting. I find gentle humour helps a lot too (but you have to tread carefully!). Make expectations clear at the start: Be honest about what can be done given the resources allocated for your project, even if that makes you seem unpopular. Make sure everyone knows what the end product might look like and approximately how much time and work is required from everyone on the team to get it done. Under-promise and over-deliver: This is the universal rule for all consulting projects. It’s way too easy to do the opposite! We all want to portray ourselves as heroes who can achieve anything, but we look a whole lot better in the long run if we don’t oversell ourselves and come up short. Communicate early and often: Projects can go off the rails because important players feel left out. SME’s might deliver a suite of Powerpoints or PDF’s by email and then either they or the ID “goes dark” for a few weeks or months. Make sure you send out frequent updates on your progress and ask for their input where you need it. If things are taking longer than expected on your end let them know why and show them how the final product will be much better for it. Use your expertise to guide the project: No one knows your job as well as you. Don’t assume that the SME’s or project administrators will have the same insights as you. Have the confidence to anticipate their design needs and suggest creative ways they can achieve their education goals. However, this can get tricky if the SME is wedded to multiple choice assessments and seems resistant to your ideas for other approaches. That’s where the good rapport really helps. Let them see some of the “magic” behind the scenes: As with the abstract art piece seen above, the end user enjoys your final product without really being aware of the endless hours of work and design decisions that went into creating it. In early meetings, I try to show examples of how we adapted passive slide show lectures into engaging, active learning experiences for students. And I emphasize the work required and how the SME or content expert can be involved in this process from the beginning. Imagine you could take content from your textbook and transform it into a whole new personalized, customized online learning experience for your students. With an Open textbook, you can do that! Here’s how Carol and I worked together to transform a unit from her Open textbook into a series of modules. Carol is a faculty member in our Academic Upgrading program at Cambrian College. Carol’s students come from a wide variety of backgrounds and abilities. They are in class working on different subjects at different levels. Often, they are working on self-directed content at their own pace on their own time. This is usually in the form of workbooks and other types of materials. Due to the format of the way students work in the program, Carol can’t deliver a traditional lesson as she would if all her students were studying the same subjects at the same level (ex: first year English). She does provide 1-1 assistance but with a large group, she can’t spend a lot of time with each student. She approached me to figure out a better way for her students to have a more engaging and informative experience. She wanted to develop something that would give students immediate feedback and help them learn the content outside of just a plain old workbook. Carol decided to try this new idea with her math students. She found they had a lot of questions with some of the concepts in the fractions unit. She was using a textbook called Adult Literacy Fundamentals Mathematics: Book 5 by Liz Girard, Wendy Tagami , Liz Girard, Wendy Tagami; licensed under a Creative Commons Attribution 4.0 International License, except where otherwise noted. She found it through a search on BC Campus’ OpenEd Resources library. Based on her request, we came up with a plan to develop a series of online modules that would take the fractions content from her textbook and make it interactive on any device. We chose to use the Explain Everything app on iPad combined with H5P Interactive Video as our tools. Explain Everything allowed for Carol to draw and narrate a lesson explaining a concept and record it as a video. Then, H5P allowed for us to layer on interactive questions to her video lessons. These allowed her to both deliver a lesson and give students the opportunity to practice. The fact that Carol had chosen an Open textbook for her course allowed us the freedom to use the content in a way that would not be possible if the content had been protected by copyright. We were able to choose images and examples from her textbook and include them in our videos and interactives. This to me is the essence of Open Education and why I believe it is important for the future of education. I set Carol up with the Explain Everything app and a stylus on one of our Hub iPads. She went to work creating lessons for each of the sections of her unit on common fractions. She was able to combine her narrated audio with a visual presentation. You can see how we did that in the H5P interactive video above. After all of the lessons were recorded, we uploaded the videos to YouTube. Next, we went into Moodle and added a series of H5P interactive videos that pointed to the videos we uploaded to YouTube. Based on the plan we developed for the modules, I inserted exercise questions at various points along the timeline. This way, students would be introduced to the content, practice some questions, listen to more of the lesson, complete some additional questions and so forth. Each unit culminated in a “self-test” which consisted of a sequence of questions to test the students’ understanding of the content. With a bit of training and the right tools, Carol was able to learn some new technology and develop additional videos and interactives on her own. We credit Jeffery Tranchemontagne, our Multimedia Specialist who helped us enhance the videos with higher quality audio and some editing to make them more concise. Thanks Jeff! At the moment, we’ve developed one unit in her textbook and Carol is working on building additional units to deploy to students in the near future. Is Everyone An Instructional Designer? Am I an instructional designer? I work in educational technology, talk to people about using tools and help people design better learning, but does that make me an instructional designer? Educational technology is a place that can often drive pedagogical change, and it’s strange how often it goes unacknowledged as an accomplice in converting people to better pedagogy. How often do you as an instructional designer have a conversation about a piece of technology that forces the person you’re working with to rethink what they’re doing, and how they’re doing it? It may not be the great revelatory exclamation of “Oh my, this is going to change my life!” – but sometimes drastically, sometimes subtly, a change is made. It’s change that is opted into, by selecting the tool or technology, but it is change nonetheless. I can hear the counter arguments; “that’s not change, it’s choice!” I’d counter, that it’s a choice to change. Often in the adoption of a new tool, you have an opportunity to make large scale changes; most people don’t do that, but they make a smaller, incremental change. Sometimes change stops there. Sometimes, it pushes further, changing assessment strategies, approaches to instruction, facilitation techniques. That’s where you (or I) are able to help. My role has been traditionally to help people with the how of things; how to set up a gradebook in the LMS, how to use classroom response tools to do things in the classroom – and early on I realized that lots of people really were looking for how-to, but never thought much about the why they were doing things. Sometimes the answer to why was simply, “the department asked me to go online” – but the people who did think about the why ended up much more satisfied. Looking to help in a more productive way I’ve become somewhat annoying in consultations, asking things like “why are you doing this?” and “what do you hope to accomplish with this change?” Those questions are less about technical details, and more about design of learning. It’s been interesting to note how instructional design intersects with media development, technical support, systems administration and of course, teaching. Each of those intersections can be opportunities to talk about how that particular learning experience can be improved. Creating a video? Why, what can that help you accomplish? The questions open up a rich conversation filled with the proverbial box of chocolates. In some ways, that make me, a (looking at my work badge) Learning Technologies Analyst, an Instructional Designer. It’s unfortunate, that I didn’t know that until six or seven years ago. Honestly, it would’ve made my early career make a lot more sense. So those of you who are working in educational technology, supporting the use of a tool and putting in tickets to bug vendors to fix things, you might be an Instructional Designer. https://idigontario.ca/wp-content/uploads/2017/11/iDigLogo2-01-1030x246.png 0 0 IDIGadmin https://idigontario.ca/wp-content/uploads/2017/11/iDigLogo2-01-1030x246.png IDIGadmin2018-10-28 23:04:022019-02-25 15:03:42Is Everyone An Instructional Designer? I participated last week in the Introduction to Digital Pedagogy with Sean Michael Morris @slamteacher and Jesse Stommel @jessifer, sponsored by @eCampusOntario and @RyersonU – Office of eLearning. The all-too-brief workshop, along with my review of preparatory materials, represented some of the most impactful hours of professional development that I’ve experienced so far in my career – truly changing the way I think about my work as an Instructional Designer. Allowing for “Desire Paths”: I recall once looking at a well beaten stretch of soil between some shrubs in my daughter’s school yard. A friend with a background in landscape and urban planning described it as a “desire line” or “desire path”. It was the trail that the children had instinctively chosen and created over time in spite of the many manicured and carefully placed walkways that had been called for by the yard’s architect. After #digped, it seems clear to me that, like the young creators of those desire paths, students will always find unanticipated and wonderful ways to enter, exit, and navigate through the learning events and environments that we design, and these alternately carved-out tracks should naturally contribute to our own learning and growth as designers and instructors. Planning for the actual rather than the imagined: More often than not, I might begin my course development work with an instructor by asking them to tell me about the learners they expect to be in their course. After #digped I will intentionally, rather than incidentally, encourage instructors to consider their plans to discern and understand the needs of the learners who arrive in their course. Set the stakes aside (when and as possible): Over the years, it has been common for me to find myself in spirited exchanges regarding the grading of discussions in an online course – frequently wrapping up with the establishment of an assigned participation grade in order to create a sense that something is “at stake”. After #digped, I will intentionally, rather than incidentally, focus these exchanges on opportunities for and ways of inspiring, rather than requiring dialogue, when planning to foster community in an online course. Span out rather than rein in: Rubrics and exemplars, along with the phrase “let show them what ‘good’ looks like,” have long had a place in my conversations with instructors. Consider the “being” in the “space”: After years of work in the digital learning space, it is easy to fall into the habit of seeking out digital equivalents to analog/in-person experiences. In other words, if the digital is possible, the digital is necessary. After #digped, I will intentionally, rather than incidentally, encourage myself and my collaborators to consider the human beings and spaces that encompass the online community of learners. Why let the fact that a course is online distract us from the fact that we inhabit a world where a physical artifact or tool (a notebook, a canvas, a candle, a bell,) can often be as easily at hand, and better serve a pedagogical purpose, than its digital equivalent (not to mention requiring less data…)? My responses to these queries often point them to any/all analytics or reporting features of these tools, with, at best, a note of caution or disclaimer regarding the type of information that might be gleaned. After #digped (and also following up on themes of #OpenEd18), I will promote among my faculty collaborators a deeper reflection on what they will do with this information, and how they will communicate with their students about the availability of this data and their intentions regarding its use. Beyond the “Welcome” Page: Sure, I regularly encourage instructors to open their online course content with a “welcome”, and to use a voice that directly addresses and engages the student, but have I encouraged them to truly sustain that sense of “welcome” throughout their course? After #digped, I find myself increasingly examining what @slamteacher calls “hospitality as pedagogy” – in other words, the kinds of interactions that are “invitational” rather than “contractual” or prescribed between instructor and learner. Conversation in a world of compliance: So many of us, in our respective roles in higher education, work within systems that require observance of multiple requirements, policies, and standards – beyond our discretion or control. After #digped, I will regularly remind myself to not only dialogue with instructors regarding their perspective on the requirements that impact their work, but also urge them to actively include their students in the conversation regarding the many factors that shape their obligations to their institutions and to one another. Inspiration, and intention, these are the gifts that I take away and hope to share out — after #digped…. Maureen Glynn is an instructional designer with Digital Education Strategies at The G. Raymond Chang School of Continuing Education, Ryerson University. This is the third post of the IDIGOntario #9x9x25 Challenge! As instructional designers, an important part of our role is to provide professional development to faculty and instructors (though how it can be received varies). This faculty development can take many forms, e.g., it can be one-on-one or in a group; it can be done in person, over the phone, via webinar, via email, via blog-post, via tutorial, in a handout, etc. Ask faculty which topics they want to learn more about – Instructors will be more invested in learning about topics that matter to them. At the end of each of our workshops, we ask for participant suggestions on future workshop topics. Consider topics that are important to your institution – A couple of our recent topics have been accessibility and open educational resources. Since the introduction of the Accessibility for Ontarians with Disabilities Act (AODA), our team has created a number of processes and guidelines to help ensure that the course materials we develop meet the standards of the AODA. A workshop like Let’s Connect! helps us share such guidelines. Invite guest instructors to share their experiences – We’ve had positive feedback from sessions where guest instructors shared their practices with their peers; instructors attending such sessions reported this as “a great source of motivation.” Part of the success of our professional development course for new or seasoned online instructors, Teaching Adult Learners Online, is that it is facilitated by an experienced online instructor. Carefully plan out the workshop – The more interactivities you have, the more important it is to carefully plan all of the details. A lot of people and steps are involved in making just one two-hour workshop run smoothly. Offer it in different formats – Don’t assume that all instructors can come to campus on the date/time you’ve selected. Let’s Connect! started as an in person offering, but it evolved into being simultaneously offered both in person and via webinar, which opens it up to more participants. Make it an active learning experience – Rather than ask faculty to watch a presentation or a demo, ask them to try out a tool or engage in guided discussion with their peers. In feedback from our early sessions, instructors told us they wanted hands-on experiences. Even better, let your faculty leave the session with something tangible, such as a communication plan or a toolkit of open educational resources. Select the most convenient timing – In the early years, we received feedback from instructors saying that the workshop should be offered before the semester starts. Unfortunately, this is hard to do, as some of our instructors aren’t hired until very close to the semester start, so we run this workshop during the second week of classes. We also try to make the offering convenient for our instructors, i.e., offer it right before evening classes at our school begin, so that any classroom instructors can attend in person before they teach. Connect faculty to other services at your institution – Invite experts or representatives from other units (e.g., the library, computing services, etc.) to co-facilitate your workshop or let faculty know where to find them and the type of support they can provide. Try to break up the silos. For more ideas on designing and delivering effective faculty development, check out the tips from Patty Phelps in her article Five fundamentals of faculty development. Mariam Ahmed is an instructional designer with Digital Education Strategies at The G. Raymond Chang School of Continuing Education, Ryerson University. Phelps, P.H. (2018). Five fundamentals of faculty development. Faculty Focus. When I signed up to be on the IDIG team I very vaguely said I would like to write something about the “Front End Analysis” phase of Instructional Design. Also known as the “What are we doing and why” part. If you do this part well you can avoid making big mistakes down the road. You might even realize that you shouldn’t even do it at all. You also tend have that “come on, come on, let’s get going!” feeling buzzing around you. I am feeling that right now as we prepare to try a new way of delivering Ontario Extend in January. But no matter how many angles you try to anticipate, something will surprise you when you implement it. A good example of this came from the scholarly project I worked on to complete my ID Master’s. I created an instructional Alternate Reality Game (ARG). It was designed to help youth identify problem gambling behaviours and know how to reduce the harm of them. I completed a lengthy front end analysis in which I tried to anticipate who the learners were and what their needs would be to complete the game. I never really considered that some kids might not be up for suspending their disbelief in what was meant to be a fun way to learn. The first test went great, with a group of ninth grade students who were asked to participate and agreed of their own accord. They had fun and were successful in taking the story to its conclusion. The final test run, however, was a different story. In working with the program facilitator for the gambling awareness group, we were able to bring the game to test it out on an entire class of (I think) 11th grade students at an “alternative” high school. I don’t recall too much about the makeup of the class or the reasons they had enrolled in a “different” kind of high school. In general you could say that the students were rightfully kind of pissed off about how their education was going so far. They didn’t want to pretend. They didn’t want to make believe. They didn’t give a damn about rescuing a fake dog. They did the game activities, but it would have probably served them better to give them a list of problem gambling behaviours to look out for and harm reduction strategies to use and to just have a discussion about how these things have affected their lives. I remember clearly the look one student gave me when he realized I was trying to trick him into playing along. It was utterly deflating. The results of the test run were that yes, the students reached the objectives. Learning was measured. But the feeling in the room was not the fun buzz I was working toward in the back of my mind. It was a stark opposite. I’m going way over 25 sentences by digging in to that anecdote. My point is that I did not anticipate, at all, that this idea of learning via a game would resonate so poorly with these students. I didn’t ask the right, or enough questions in my front-end analysis. JR Dingwall’s post in which he did ask the right questions to help bring about a great result, is what got me thinking about what questions to ask in the beginning. So I ask you, what questions do you ask yourself and others when you first sit down to analyze an ID project? How can you avoid making something that leaves students feeling flat and misunderstood? For this first post in the IDIG team entry in the Ontario Extend 9x9x25 Challenge, I decided to post a random-order, grammatically-incorrect-but-trying-to-keep-it-to-one-run-on-sentence-each “25” cents worth of tips that have served me well in my work as an instructional designer. I noticed many of these align with attributes of Ontario Extend’s Empowered Educator, which was a nifty revelation! Those that didn’t I would consider “slippery” as they are difficult to nail down into any one of the six, but are threaded through. Develop and Tap into a PLN – The absolute, no holds-barred, critical importance and boundless benefit of cultivating a PLN – or Personal Learning Network, or People I Lean oN (okay that doesn’t really work, but you get the drift). Build team rapport – with any project, but in particular course design, where you’re bringing a bunch of diverse people together, it’s critical to take time at the start to get to know a bit more about each other prior to digging into the work (working with educators, I use these visioning exercises and encourage them to take the Teaching Perspectives Inventory). Be adaptable – to move projects along, I’ve learned it’s easier to be flexible in response to how others like to work, track and communicate rather than decree the use of a particular communication tool or the always crowd-pleasing project management software. Teach a course – nothing better in understanding how a course design actually works in a real-class situation that acting as both designer and teacher (plus you have complete control which is also fun once in a while – see the Digital Literacy for Learning modules I co-developed with fellow ID Devon Mordell as part of our DL course). Stretch your technological muscles – this can feel daunting, but if you come across new tech that is intriguing, take the time to try it out a bit – Ontario learners and educators have free lynda.com access right now and there’s a shirt-ton of tech tutorials to take advantage of. Sprints for projects – I read and recommend this book (not open boo) and have been involved in various sprints, and can attest to its formula in getting things done faster – perhaps a framework to consider for trudging course (re)designs? Research – even if your job doesn’t require you to do research, get in on a project – you don’t have to be lead investigator – a small role as a contributor to the project affords great learning opportunities. Curate as you go – it’s hard to keep track of, or backtrack looking for, all the goodies you come across, are sent, or hear about, so make sure you have a way to curate them away (I personally like and use diigo). Experiment – Going big or teensy, if there’s a way to try something new and see how it goes, go for it – nothing breeds innovation more than a little experimentation. Don’t worry when you don’t know things – ‘fess up, ask questions and never bluff. Practice inclusive design – the more you practice, the more ingrained it will be in your work (as it should be!) – and I’ve found the stellar work out of OCAD’s Inclusive Design Research Centre a true gift. Hang in the back (of class) – if I’m tasked with redesigning a f2f course to an online one, I ask the instructor if it’s okay if I sit in the back row and watch them in action – even though it’s getting harder to ‘blend in’ with the twenty-somethings, I get a lot out of this observation. The importance of empathy – I wrote about this in a blog post, and often refer people to this short clip by the amazing RSA Animate – and when searching for that found this clip by the same fantastic folks on the 21st century and the importance of outrospection. Set a Pomodoro Pace – feeding further into time management, this tomato timer helps me focus, take breaks and complete tasks – no easy feats (now if it could just help me with the laundry). Laugh – I’ve always been lucky to work with people with superb comic timing (Terry Greene anyone?) and sharing a belly laugh has proven to be the number one bonding mechanism (according to my completely unsubstantiated but highly-enjoyable research). Careful of the criticism – giving (and getting!) honest feedback can be sweat-inducing if it is in the form of criticism – tips like these have helped me stay aware of the motivations and focus on the situation and not the individual. Presenting is a present – whether it’s a conference, meeting or group of peers, presenting not only offers a way to share your professional work, I find the process of pulling it together, thinking, reflecting and sequencing ideas, offers many side benefits. Small win parties – okay maybe a party for one, but it’s important to do a quiet victory dance every time one of your ideas comes to fruition, especially if you had to go to the mat for it. Design is everywhere – I took completed accessed this Udacity course, “Intro to the Design of Everyday Things” a while back and it provides a ‘big picture’ of the role design plays in all of our lives, and helps you think about design decisions you make. That’s it- definitely more than 25 sentences here but I’m thinking I can bank the extras and write a 15 sentence post next time around as an adapted 9x9x25 entry, right? What do you get when you throw a bunch of instructional-designed minded people into a room? Equal parts sharing, openness, action – and nibbling on IDIG cookies iced and baked by highly-valued member Peg French. IDIG held their first face-to-face meeting back on March 22nd (yes this blog post is long overdue) and welcomed over 60 teaching and learning professionals, educators and others interested in instructional design to the elegant faculty club space at McMaster University. You can see what our agenda looked like here, but let’s start things off by talking about what happened during our icebreaker “brain dates” table topics session, which from the feedback was a highly-enjoyed activity. We set up a table per topic and it was facilitated by one of our working group members. Participants gravitated to whatever table interested them, had a conversation and then moved on to another topic after about 15 minutes. Faculty Development Initiatives – How can we share the resources we create for our faculty development workshops more effectively? Instructional Design Models – A move away from ADDIE to SAM as a model for course design (see this recent blog post by Raccoon Gang on this very thought). Traits of an ID – Conversation centered around ideas we can integrate from the book Learned Optimism by Martin Seligman. Mentorship/Working with Faculty – Demonstrating other ways of doing things to entice faculty to try new approaches – using prototypes and sample pages to show them how their online teaching could work differently. Next up, we welcomed Dr. Joe Kim, McMaster University, who gave a memorable (get it?) talk about motivating durable learning through instructional design. Dr. Kim’s research is fascinating and offered us a glimpse into how we can help design and structure course materials in a way that leads students to deeper learning. We tapped into our creative side after lunch with Giulia Forsythe, Brock University, who took (some of) us out of our comfort zones during a visual note-taking workshop. Not only was it fun to get out the markers and ‘draw’ on our experiences, it was enlightening to think about alternate ways to organize our knowledge and reimagine how we conceptualize our note-taking practices. See Giulia’s reflection on IDIG day on her blog. Our morning and afternoon workshops featured: Matt Clare, talking about using the cloud version of Canvas to create Open Content; Terry Greene leading us on the Fleming adventure in creating a Teaching and Learning Blog; Jenni Hayman and Maureen Glynn showing us how to integrate OER into our course designs; and a fun-filled EdTech test kitchen with PressBooks, H5P, Augmented Reality and Virtual Simulations ‘stations’ for circulating, doing and discussing! The day concluded with a lightning round session where anyone was free to get up and briefly talk about, demo, plead for help on, instructional design projects they have been involved in. We were blown away by the high calibre work our colleagues are engaged in and will look to having more opportunities to share and learn from one another in a similar fast-paced format. If you want to take a look at any of the notes, slides, presentations, resources for the day, they can be found at the IDIG March 22nd Collaboration Station Google folder. You can also check out the Twitter action via this social wall created by Terry Greene. As with any good networking opportunity, we closed the day with beverage clinking, munchie sharing and more idea swapping at the Phoenix campus pub and look forward to many opportunities to do more of the same! A colleague (and IDIG member!) recently pointed me to a report from Intentional Futures on instructional design in higher education. Their research was looking to clarify the role of instructional designers, the impacts they have on student success and provide new understanding about how IDs strive to improve education. While the entire report is filled with findings about all aspects of ID and the benefits to institutions, administration, faculty and students it also highlights some pitfalls and other barriers to achieving success in projects. If you are reading this from an ID’s perspective, you may not be surprised to find that the number one challenge IDs face in their daily responsibilities is difficulty in collaborating with faculty. These difficulties may be due to personal differences that strain the achievement of a good working relationship between an ID and a faculty member. However, the data collected and results from this report point to a larger misunderstanding – a misunderstanding I wanted to learn more about.